WASHINGTON (AP) -- Nature is pummeling the United States this year with extremes. Unprecedented triple-digit heat and devastating drought. Deadly tornadoes leveling towns. Massive rivers overflowing. A billion-dollar blizzard. And now, unusual hurricane-caused flooding in Vermont. If what's falling from the sky isn't enough, the ground shook in places that normally seem stable: Colorado and the entire East Coast. On Friday, a strong quake triggered brief tsunami warnings in Alaska. Arizona and New Mexico have broken records for wildfires. Total weather losses top $35 billion, and that's not counting Hurricane Irene, according to the National Oceanic Atmospheric Administration. There have been more than 700 U.S. disaster and weather deaths, most from the tornado outbreaks this spring. Last year, the world seemed to go wild with natural disasters in the deadliest year in a generation. But 2010 was bad globally, and the United States mostly was spared. This year, while there have been devastating events elsewhere, such as the earthquake and tsunami in Japan, Australia's flooding and a drought in Africa, it's our turn to get smacked. Repeatedly. "I'm hoping for a break. I'm tired of working this hard. This is ridiculous," said Jeff Masters, a meteorologist who runs Weather Underground, a meteorology service that tracks strange and extreme weather. "I'm not used to seeing all these extremes all at once in one year." The U.S. has had a record 10 weather catastrophes costing more than a billion dollars: five separate tornado outbreaks, two different major river floods in the Upper Midwest and the Mississippi River, drought in the Southwest and a blizzard that crippled the Midwest and Northeast, and Irene. What's happening, say experts, is mostly random chance or bad luck. But there is something more to it, many of them say. Man-made global warming is increasing the odds of getting a bad roll of the dice. Sometimes the luck seemed downright freakish. The East Coast got a double-whammy in one week with a magnitude 5.8 earthquake followed by a drenching from Irene. If one place felt more besieged than others, it was tiny Mineral, Va., the epicenter of the quake, where Louisa County Fire Lt. Floyd Richard stared at the darkening sky before Irene and said, "What did WE do to Mother Nature to come through here like this." There are still four months to go, including September, the busiest month of the hurricane season. The Gulf Coast expected a soaking this weekend from Tropical Storm Lee and forecasters were watching Hurricane Katia slogging west in the Atlantic. The insurance company Munich Re calculated that in the first six months of the year there have been 98 natural disasters in the United States, about double the average of the 1990s. Even before Irene, the Federal Emergency Management Agency was on pace to obliterate the record for declared disasters issued by state, reflecting both the geographic breadth and frequency of America's problem-plagued year. "If you weren't in a drought, you were drowning is what it came down to," Masters said. - Oklahoma set a record for hottest month ever in any state with July. - Washington D.C. set all-time heat records at the National Arboretum on July 23 with 105 and then broke it a week later with 106. - Houston had a record string of 24 days in August with the thermometer over 100 degrees. - Newark, N.J., set a record with 108 degrees, topping the old mark by 3 degrees. Tornadoes this year hit medium-sized cities such as Joplin, Mo., and Tuscaloosa, Ala. The outbreaks affected 21 states, including unusual deadly twisters in Minnesota, Wisconsin and Massachusetts. "I think this year has really been extraordinary in terms of natural catastrophes," said Andreas Schrast, head of catastrophic perils for Swiss Re, another big insurer. One of the most noticeable and troubling weather extremes was the record-high nighttime temperatures, said Tom Karl, director of NOAA's National Climatic Data Center. That shows that the country wasn't cooling off at all at night, which both the human body and crops need. "These events are abnormal," Karl said. "But it's part of an ongoing trend we've seen since 1980." 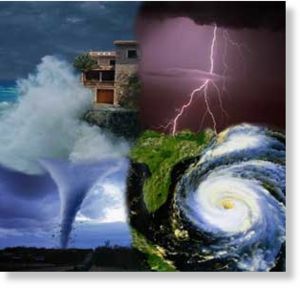 Individual weather disasters so far can't be directly attributed to global warming, but it is a factor in the magnitude and the string of many of the extremes, Karl and other climate scientists say. While the hurricanes and tornado outbreaks don't seem to have any clear climate change connection, the heat wave and drought do, said NASA climate scientist Gavin Schmidt. This year, there's been a Pacific Ocean climate phenomenon that changes weather patterns worldwide known as La Nina, the flip side to El Nino. La Ninas normally trigger certain extremes such as flooding in Australia and drought in Texas. But global warming has taken those events and amplified them from bad to record levels, said climate scientist Jerry Meehl at the National Center for Atmospheric Research. Judith Curry of Georgia Tech disagreed, saying that while humans are changing the climate, these extremes have happened before, pointing to the 1950s. "Sometimes it seems as if we have weather amnesia," she said. Another factor is that people are building bigger homes and living in more vulnerable places such as coastal regions, said Swiss Re's Schrast. Worldwide insured losses from disasters in the first three months this year are more than any entire year on record except for 2005, when Hurricane Katrina struck, Schrast said. Unlike last year, when many of the disasters were in poor countries such as Haiti and Pakistan, this year's catastrophes have struck richer areas, including Australia, Japan and the United States. The problem is so big that insurers, emergency managers, public officials and academics from around the world are gathering Wednesday in Washington for a special three-day National Academy of Sciences summit to figure out how to better understand and manage extreme events. The idea is that these events keep happening, and with global warming they should occur more often, so society has to learn to adapt, said former astronaut Kathryn Sullivan, NOAA's deputy chief. Sullivan, a scientist, said launching into space gave her a unique perspective on Earth's "extraordinary scale and power and both extraordinary elegance and finesse." "We are part of it. We do affect it," Sullivan said. "But it surely affects us on a daily basis - sometimes with very powerful punches."